Hey Everybody, It’s now after midnight. I had the pleasure earlier this morning of hearing the guys here in Houston do their thing on live radio; The Steven’s and Pruett Show. Here’s my report. While on the subject, a personal observation, if I may. I feel compelled. Alice’s assistant Renfield has posted stories on here about Glen being frail and burned out. I personally spent time hanging out with him. One occasion, at Billy Blues after the show; rehearsal for upcoming Area 51 gig. Fun! Nothing negative. Glen was on fire by the way. Lead vocals on a very dirty blues tune. One of those had to be there moments, I guess. Michael Bruce – main vocals and guitar. John Glenn – keyboards and backing vocals. Because it was a live radio event, the band instead of doing one long set, broke their performance down to 4 small sets. Five sets if you include Richie’s. His first time having a moment like this on the national airwaves. An audience of over a quarter million. 03) Richie Scarlet – from his new CD “Wise Guys In New York” – Morning Dew. Blew me away listening! Michael’s vocals were damn good! Everyone played their parts well. Literally, the hard rock group, Bruce Smith Buxton Scarlet and Glenn, rocked the house. Eyewitnesses report that two light fixtures from the ceiling came crashing down, hitting the floor while the band was playing. Luckily no one was hurt. A preview of what is going to go down this Sunday night, at Area 51. See you there! 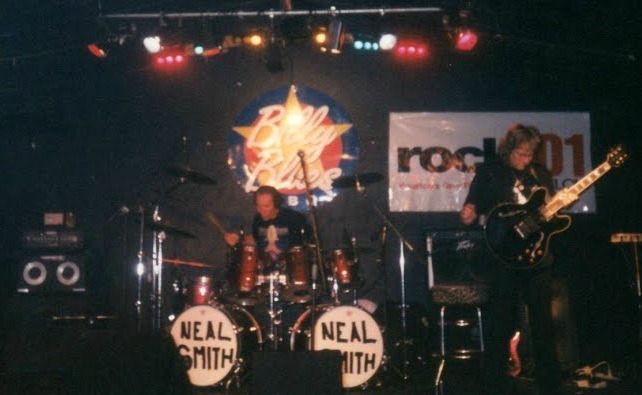 Neal Smith (drums) and Glen Buxton (guitar) – Billy Blues – Houston KLOL 101.1 FM Broadcast. Richie Scarlet (bass) – Michael Bruce (vocals and guitar) – Neal Smith (drums) – Billy Blues – Houston KLOL 101.1 FM Broadcast. Update 2019 – Looking back, maybe Brian “Renfield” Nelson was on to something? Glen Buxton passed away less than two weeks after these pictures were taken? In 2009, the Grim Reaper would count him out, as well. May they both be resting in peace. From the Gary “Uncle G” Brown Autograph Collection (pre-signed just for me) – Stevens & Pruett (both now deceased).